You know how you sometimes start out with a possible conclusion based on the research you are going to do–but have not yet started–but at the end of the process you’re smacked upside the head because your original suspicion was wrong? Welcome to the world of biomechanical and pedigree analysis for the leading sires in North American and Australia/New Zealand. Our firm has spent a half dozen years traveling Down Under to attend yearling and 2-year-old sales where we offer our biomechanical, cardio and BreezeFigs services. Occasionally we’d find time to visit stallion facilities to gather measurements on leading or promising sires. What we discovered along the way is that there are some biomechanical patterns in the yearlings and 2-year-olds that are a bit different than those in North America. Going into this project, we thought (somewhat anecdotally) that we’d analyzed a good many yearlings and 2-year-olds whose front legs were a bit shorter than the rear legs and/or whose body sets were lower at the elbow than at the flank. Given enough power through the quarters and quickening gears (rear triangle of ilium, femur, tibia), either of those attributes generally indicate the horse would be quick to start and likely to do best at sprint distances if pushed early. However, if the horse also possessed very good stride extension it would probably do better by settling early and using power in the drive, generally at a mile or a bit further. Most of these horses possess excellent power and quickening gears behind. To us, this was all very logical given the racing programs in both countries, though more emphasized in Australia where speed is king (and queen) and (it appears to us) the majority of what we would consider quality maiden and allowance races and stakes races are at a mile or less–G1 Melbourne Cup, Classic and Group events notwithstanding. This pattern is on display in North America these days thanks to the simulcasting of races from Down Under on a variety of platforms from television to computer and phone streaming. You watch these races and if horses were automobiles you’d hear vroom! vroom! vroom!…most especially in the last 300 yards. One might say this is like most races in North America are run. But except for turf races featuring good (usually imported) horses, the explosiveness isn’t there, it’s more of a steady, grinding action. That is a subtle biomechanical difference that one can illustrate by noting the speed horses Down Under are more like Corvettes or Maseratis while those Up Here are more like BMWs or Audis. On the other hand, we have also come across a substantial number of individuals with more complicated biomechanics. This pattern usually involves long front legs and either a high body set or a low body set at the elbow compared to body set at the flank. If the horse has a low body set, it is more efficient when the horse settles in stride to accommodate what could be some high knee action which can be exacerbated if the horse is pushed early–a combination that wastes energy. If the body set is high at the elbow, there is a likely chance that the horse will have an uphill trajectory, and if pushed too early this could result in pinwheeling (extreme high knee) which is inefficient and wastes energy. Like the speed demons, a goodly portion of these individuals also possess excellent power and quickening gears behind. 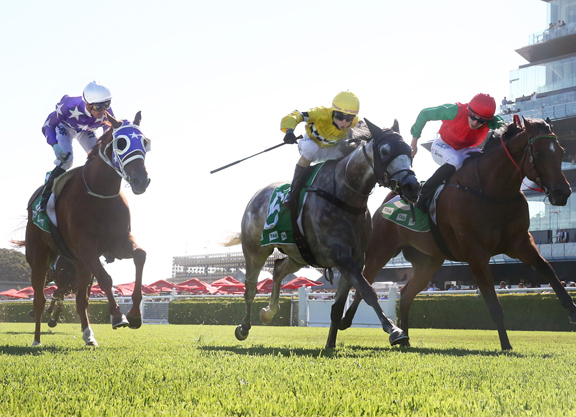 Efficiently built horses with these attributes Down Under have an affinity for settling behind most of the field in long distance races which, like all races, are on the turf. Like Chevrolet Explorers and Dodge Ram pick-ups, these horses need to get into gear, but when they get rolling, watch out! Horses like this are also found in the North American population and the majority are also more suitable to turf racing, most likely at distances above a mile. The turf gives them a better grip behind to settle, and since most turf races are longer than a mile they have some time to settle and take advantage of power and quickening gears that are more conducive to wearing their rivals down in the end. These biomechanical differences occur in North American runners, of course, but in doing some further research it appeared there may be a larger pool of these two distinct “power types” Down Under. This spurred a thought as to whether the stallion population in these two countries was more geared to produce power rather than a more rounded combination of power and stride factors. To do this, we decided to utilize our Phenotype Target to plot the Top 20 sires of 2018 in North America and the Top 20 sires in Australia/New Zealand for whom we have data for the Southern Hemisphere 2017-2018 periods to see if there are any clues we could uncover. We eliminated any dual-hemisphere stallions to narrow the study to reflect indigenous characteristics, if any. The only one we haven’t measured is second-leading sire I Am Invincible, but we are confident he is quite similar phenotypically to the others. Why? Just look at their target–only four are not Power types. When we examined the biomechanical profiles of all of the stallions on each target we discovered that more than half the Southern Hemisphere stallions had long front legs along with a combination of other factors that reduced extension. However, and it’s an extremely important however: most of them also had great power and many have short tibias, which is a feature of horses that have great finishing kicks–especially on the turf. The North American sires simply do not have that kind of profile. For the most part, they have square body sets, very good power through the quarters, and tibias that combine with other finishing kick attributes that are more likely to generate solid but not brilliant closing kicks. Without doing anything other than looking at sire lines, we found a perhaps more startling difference in the crowd: Although there are nine representatives of the Mr. Prospector line among the North American sires, they are spread among his sons Fappiano, Gone West, Smart Strike and Forty Niner. Four sons of A.P. Indy are there along with six representatives of the Northern Dancer line through various branches, and one through In Excess (Ire). That’s pretty good distribution. However, when we get Down Under it’s a whole different story: Seven of the ones we plotted are sons of the exceptional speed influence Danehill and one is by his sire Danzig. That’s more than an arched eyebrow discovery. And when you throw in I Am Invincible (a great grandson of Danzig who is not on the target) the eyebrows go up to your hairline. 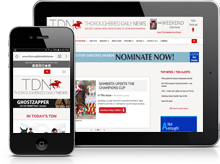 There are six representatives of Northern Dancer’s line through several branches and three members of the great New Zealand sire Sir Tristam, an Irish-bred among the crowd. When you put all of these factors together, one can see that a fascinating dichotomy exists that may be a reflection of cultural approaches on either side of the equator–one crowd would ask you how you’d like your steak done along with what wine; the other would get right to the point and throw another shrimp on the barbie while handing you another lager. Bob Fierro is a partner with Jay Kilgore and Frank Mitchell in DataTrack International, biomechanical consultants and developers of BreezeFigs. He can be reached at [email protected].